Playa d'en Bossa, Ibiza. Clubbing, Beach, Adults-only, Luxury, Playa d'en Bossa, 4-5 Stars. Modern accommodation close to the beach and clubs, combining Miami style and Ibiza spirit. 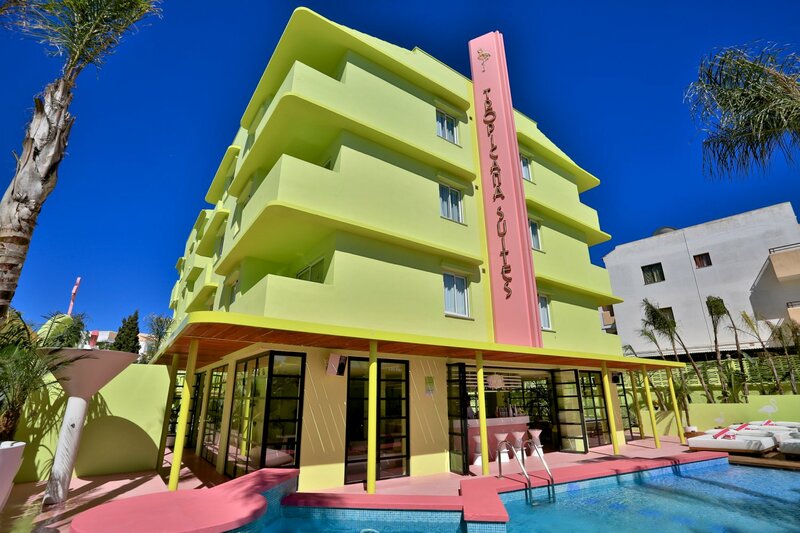 Tropicana Ibiza Suites - This cool adults-only hotel brings Miami Art Deco, tropical style to Ibiza. Expect a world of palms, flamingos, fresh cocktails and a superb musical selection, making this Concept Group hotel ideal for the modern traveller. Guests also have free run of all the excellent parties and facilities of the Santos Ibiza Suites, a couple of minutes away. Relax on one of the large Dream Beds in the pool area decked out in lively pink and lime green as DJs play cool beats to wash over you. Never be short for choice with over 30 cocktails available, or, if feeling peckish, the cafe and snack bar is ideal to fill the hunger gap. For a bigger bite, a 300-metre walk gets you all the flavours of the world in the restaurant in the Santos Ibiza Suites right on the beach. If you need anything else, the concierge service promises to meet all your needs however big or small: VIP club tables and reservations in hot new restaurants are a cinch. The air-conditioned suites are a tropical oasis of green and white, to calm the mind after those late nights out. The lounge area with kitchenette is equipped with a specially-styled SMEG fridge and is a great place to get your night started or to finish it off. The big comfy beds are your sleep sanctuary with soothing overhead ceiling fans to keep you cool. In the Santos Coast Club of the Santos Ibiza Suites you have all the entertainments without need of taxis or long walks. With its beachside location, you have the perfect stage for a variety of live poolside DJ sessions and pre-club parties put on by club promoters. There are even live music performances and open-air-cinema shows to add to the ticket. You will benefit from the peace of one of central Playa d'en Bossa's quieter zones, knowing that the beach is just a short walk away as are the excellent facilities of the Santos Ibiza Suites. The airport is a mere 10-minute drive away and Ibiza Town is only a quick dash in a taxi. With lots of cool bars and restaurants and the super clubs Hï Ibiza, Ushuaïa and Sankeys nearby, you really can have it all. Visit also the other hotels of the Concept Hotel Group in Playa d'en Bossa, the Santos Ibiza Suites and the neighbouring Dorado Ibiza Suites, both right on the beach. And brand new for 2018 we bring you the Paradiso Ibiza Art Hotel in the Bay of San Antonio and the Cubanito Ibiza Suites in the beautiful bay of Cala Gració near San Antonio.